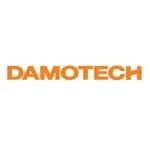 Damotech are the largest rack repair solutions provider in North America. They offer a range of rack repair kits that are the very best in the industry. They are designed to fit every type of rack and will configure to the original size of the uprights, allowing you to bring back the original loading capacity of the racking system. Each product is custom made to meet the exact needs of the client. The kits bolt on to the original rack, meaning that no hot permit for welding is required. This also means that the installation may be done in any environment, including freezers. Damotech rack repair kits can be installed in less than an hour. There is also no need to unload the rack that is being worked on. Damotech’s proprietary lifting system means that your rack will be fixed with minimal effect on the operation of your business. Damotech don’t only offer rack repair. They also stock a complete range of damage prevention and rack safety products that have garnered a reputation for robustness and efficiency. To protect rack uprights, Damo Guard and Damo Superguard are the very best rack support products on offer anywhere in the world. These products are simple to install and come with all of the hardware needed to do so. Damo Shield is a column protection system with an impeccable reputation. It doesn’t actually touch the columns and are made of quarter inch thick structural steel.